While artists and their patrons in France and the rest of Europe were still discovering and developing the Gothic style, in Italy a new type of art, inspired by the Classical heritage, was beginning to emerge. The first flowering of the Italian Renaissance came in the early years of the fifteenth century; but it was not for another hundred years, when the Renaissance was well established in Italy, that it began to flourish in France. The earliest Renaissance architecture in France is said to be parts of the Loire valley chateau at Amboise, which King Charles VIII began to rebuild in the "Italian manner" from 1495, employing for this purpose the Italian architect Domenico da Cortona. It was under François 1, king of France from 1515 to 1547, that Renaissance art and architecture first blossomed in France. Shortly after coming to the throne, François, a cultured and intelligent monarch, invited the elderly Leonardo da Vinci to come and work in France. Leonardo came to live at Amboise, bringing with him paintings and drawings many of which are still in France today, notably at the Louvre, which has the world's largest collection of Leonardo's paintings, including of course the Mona Lisa, known in France as La Joconde. François 1 not only encouraged the Renaissance style of art in France, he also set about building fine Renaissance buildings in his capital city, and outside it. The most magnificent examples of early French Renaissance architecture are the royal château at Chambord, in the Loire valley, and the rebuilding of the royal palace at Fontainebleau south of Paris. The design of the château at Chambord is attributed to da Cortona, though it is also suggested that Leonardo da Vinci, who was then living nearby, had a part in the plan. For Fontainbleau, François relied on the French mason Gilles le Breton, and a French architect Philippe Delorme, who had studied in Italy. To decorate his royal residences, François brought other artists and craftsmen from Italy, including Benvenuto Cellini; he also imported works of art from Italy. All this rapidly galvanised a large part of the French nobility into taking up the Italian style for their own building projects and artistic commissions. Thanks to the enlightened influence of François 1, the Renaissance took hold firmly and strongly on French soil. Chateau de Chenonceaux, on the Cher . Following the example of Chambord, other Loire valley castles were either built or rebuilt in the Renaissance style; among the most famous and beautiful of these are Chenonceaux, Azay le Rideau, Valançay and Villandry. Thus, along with Paris, it was the Loire valley area, notably between Orleans and Angers, that saw the finest flourishing of the Renaissance in France, and to this day offers a fine choice of monuments from this period. The Renaissance took hold, nonetheless, throughout France, and fine Renaissance buildings were put up in towns and cities across the land. In Besançon, capital of Franche-Comté, now France but then part of the Hapsburg empire, Cardinal Granvelle, the Chancellor to François' arch rival the Emperor Charles V (Charles Quint), built himself a small but impressive Renaissance palace which stands to this day. In nearby Burgundy, the château of Ancy le Franc is one of the purest Renaissance chateaux in France. The Renaissance even reached the furthest corners of Brittany, where for instance the mid 16th century chateau de Kerjean is a fine example of French Renaissance architecture. While it is in architecture and interior decoration that the French Renaissance style is most visible today, the Renaissance also saw the slow development of a French school of art, though Italian artists remained very much in vogue. One of the most extensive examples of Renaissance painting in France can be seen in the decoration of the ceiling vaults of the Cathedral of St. Cecelia in Albi (Midi-Pyrenees), painted in the early sixteenth century, even before François 1° came to the throne of France. During François' reign, Fontainebleau became the hub of artistic activity, but the Fontainebleau school was the only home-grown school of French renaissance painting. It is best represented by Jean Clouet and his son François Clouet; other important painters of the school include Jean Cousin and Antoine Caron; but apart from the Clouets, none made any great mark on posterity. It was not until the seventeenth century that French painters were to make a major contribution to the history of art. Photos: all photos on this page are in the public domain. 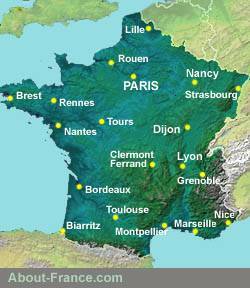 France is famed as one of the world's great centres of art and culture. The Renaissance was an artistic and cultural revolution that began in Italy in the fourteenth century, reached its peak in the Italian 15th century (known as the Quattrocento), and moved later to other parts of Europe, notably France England and the Rhine valley. Other photos are public domain.